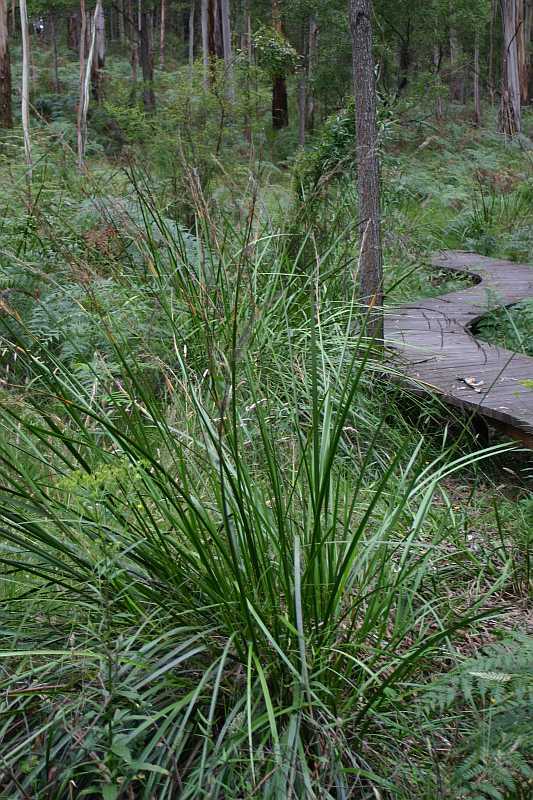 Lepidosperma gladiatum is a tufted rhizomous sedge with dark green glossy leaves and rigid biconcave stems up to a metre high. The name comes from the Greek lepis, a scale and sperma, a seed. The seeds are borne in dense panicles and are surrounded by 6 whitish scales. Sword sedge (Lepidosperma gladiatum) and Saw sedge (Ghania siberiana) are home to the Sword-grass Brown Butterfly and the Sedge skipper butterflies which lay their eggs on the leaves. These then provide a food source for the developing caterpillars. The caterpillar (larva) is initially a pale yellow-grey, before turning green with long black hairs along its body. Its head is brown-black with short hairs. 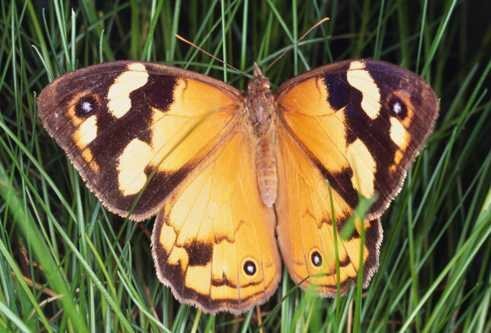 The female butterfly is orange with creamy yellow and dark brown patches towards the tip of its forewings. The male is a dull brown and orange with no pale patches. Both males and females have a small eye-spot on each wing. Butterflies drinks nectar from flowers, fermenting fruit and gum seeping from tree wounds. Butterflies fly from October to May, there is a predominance of males in the earlier part of the season and females in the later part. Mating occurs from October to December, after which the males die. The females rest through summer (known as aestivation) and appear again in late February to early May to lay their small, pale yellow eggs on the underside of leaves. The females die shortly after laying the eggs and the caterpillars hatch from the eggs after about 12 days.